2-1/2" CPVC SCH 80 Plain End Gray CPVC Pipe | U.S. 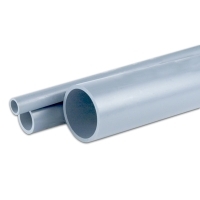 Plastic Corp.
2-1/2" SCH80 PVC pipe is 2.875"OD, 2.290"ID and has a .276" wall thickness. The maximum pressure rating is 420 psi @ 73°F. Available in lengths up to 20', priced per foot, sold in 5' or 10' intervals.